A couple weeks ago I sat down with my goal tracker and my Get To Work Book and made a plan for reaching my goals by the end of the year. I shared a glimpse of that on Instagram, and while I knew I had a lot of work to do and only a few months left to do it, I am motivated to finish. As far as my 50 Layouts goal goes, as of September 12th I had 27 layouts to do and about 14 weeks to do them in. So, about two a week. I *think* I can do that. I'm most definitely going to try. Today I've got five new layouts to share, along with a little on my process for each. Click on one of the photos above to see the layouts larger and "flip" through them. I've also got a few closeups below. Here we go! 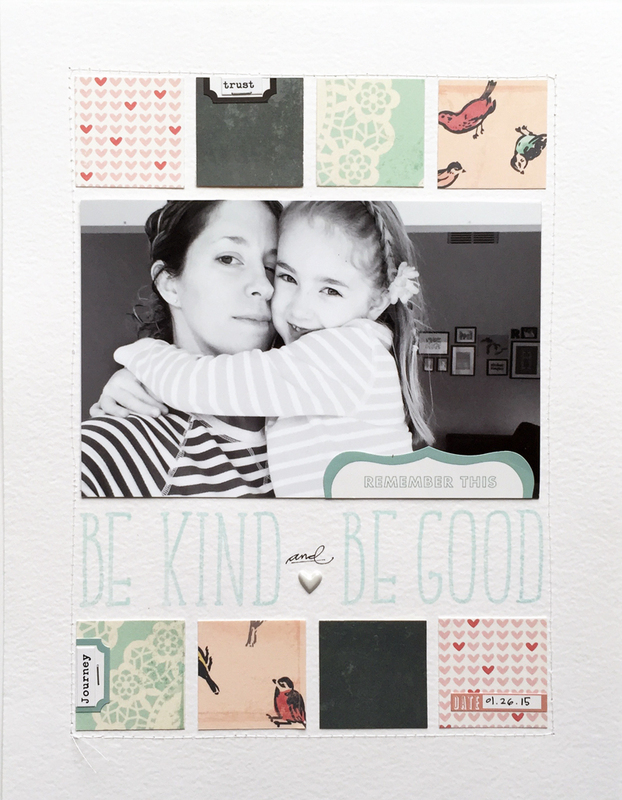 Be Kind & Be Good / This layout has been on my mind since last winter so I'm super happy to have it done. The journaling, which is actually hidden behind the photo that flips up, was something I found in my journal from earlier this year. While maintaining some privacy, it's mostly about my attempts at thinking before I speak - especially to the kids - and how I'm learning from past mistakes. Design-wise, this layout started with the alpha stamps. I began with an 8.5" x 11" sheet of off-white cardstock (it's almost textured like watercolor paper) and made a 1-inch border all the way around. I used Kelly Purkey's Randolph set to space out and then stamp the title in Color Theory Glass Slipper ink. I wanted to make sure everything was centered so I actually stamped "be kind" first, and then stamped "be good" backwards, starting with the D in good. It gave me just enough space to handwrite "and" in the center, and add a puffy heart in a coordinating color. The width of the title dictated the width of my photo, which I printed next. As a top and bottom border, I cut down patterned paper squares from Studio Calico's Hello Hello scrapbook kit. I added a few stickers from the same kit and then machine stitched a white border around the outside edge before I was done. Day in the Life 09.17.15 / It's been a while since I went big with a photo in a scrapbook layout, so this one was a lot of fun to make. Now that I'm home alone during the week, I decided to document a day in my life. Inspired by Kelly's Planner Icon stamps, I punched a bunch of 1.5" circles from some ledger patterned paper. I stamped the top portion of each circle with one of the icons using Versafine Onyx Black ink and as the day went on, I found an icon that matched what I was doing, jotted down the time and a short caption to go with it. Rather than snap a lot of pictures during the day, I chose one photo as the background of the layout, printed it at home at 8.5" x 11", and arranged my completed circles in a grid on the left side. In the blank space on the bottom right corner, I used the Outline Alpha with black Staz-on to stamp the title. Once it was dry, I used various Color Theory inks (Blush Crush, Coral Bay and Mint Hint) along with the fill-in shapes in that stamp set, to add a little color + handwrote the date at the bottom. New Beginning / This layout stumped me a bit. Mostly because I couldn't decide how I wanted to line up those 2" circle photos. I ended up putting them in a row on the left side of my layout, leaving space to add a stamped title with Kelly's new Rio alphabet stamp set in Color Theory Deja Blue ink. The layout was lacking some serious color though, so I dug through my paper and pulled out this scalloped design from Studio Calico's Office Hours scrapbook kit. It's pretty bold (for me), so I wouldn't have used it on it's own, but love it around the border because you can still see the color change from top to bottom. I cut the patterned paper down to 8.5" x 11" and then trimmed the white cardstock to leave about a 1/4" border. I added a 2" circle of red/coral paper to the top of the row of photos and a green paper to the bottom - matching the colors that were on that background piece. I added some hand drawn borders around my circles with a fine tip pen (Micron .01 is my fave here) and then matching enamel dots to each circle as well. Lastly, I wrote my journaling in the blank space in the bottom right corner and had just enough room. I stamped the date with Yes Peas ink to (you guessed it) match the green along the bottom. Fall Favorites / Also new today in Kelly's shop is her Fall Favorites Mini in Minutes kit. Rather than make a mini this month, I used the papers and stamps to make this layout. I cut down the grid paper into 2.5" strips and chose 6 fall photos (printed at 2" square) from last year to create two faux photo strips. The papers in this layout are from Studio Calico's Walden scrapbook kit (I'm putting a nice dent in my old kits, guys! ), accenting the gray woodgrain with the coral plaid along one edge. I used some gold embossing powder on kraft to make the pretty feathers I scattered around the layout and I love how they turned out! There are a couple of other fun feather designs in that kit stamp set too. I added some quick list journaling about my photos, adhered pop dots under one of my photo strips to give a little dimension and stitched my feathers down before calling this one done. Let's Camp / This summer, we took our 6th camping trip as a family of four, and have been going at least once a year since Parker turned one. It's become a tradition that we all look forward too, and now that the kids are getting older, they ask when we are going again. I love that! For this layout, I chose one photo from each trip and cropped it down to 6" wide x 2" high. I arranged them in date order, oldest to most recent, top to bottom, and before I adhered the top edge of each photo down, I used Kelly's Planner Clips die to make some date tabs with kraft paper. I stamped the month (from the same set) and then handwrote the year before slipping them to the top of their corresponding photo. In the space to the right of the photos, I stamped the small rectangular label from the Scored Tabs set and wrote in the location of each photo. Since I had a fair amount of room on the left side (and plenty to journal about) I used the lines in the patterned background to write on. Before starting, I used some old alpha stickers for my "Let's Camp" title, and stamped a little tent (from the Travel Planner set) on the GO chipboard sticker from Ali's Go Story Kit. Tomorrow I will share what my goal tracker looks like at 75%. And if you aren't signed up for Kelly's newsletter - go do that here (enter your email address in the right side column). She sends out regular updates on her products, new shop releases and classes, as well as great subscriber discounts! In this month's shop update, Kelly has collaborated with Peppermint from One Little Bird and they have a really fun kit available in her shop now. Check it out because I don't think it's going to last! In 2015, I want to use my stash and tell more stories, so I've set a goal to create 50 layouts. 28 down, 22 to go. You can see them all here.